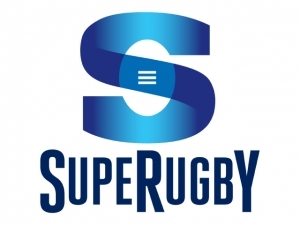 2018 Super Rugby – don’t miss a match! If you’re a rugby fan, like we are, then take note – this year’s Super Rugby viewing schedule can be downloaded for free on our website. 15 teams from South Africa, New Zealand, Australia, Argentina and Japan will battle it out on the rugby field to see who will emerge as champions, kicking off on 17 February with a match between the Stormers and the Jaguares from Argentina. The final conference match is on the 14 July, when the Sharks take on the Jaguares. Thereafter, the semi-finals take place in July, culminating in the final match to determine which team gets to take home the winner’s trophy on 4 August. WearCheck’s answer: The colour of the lube is simply a dye. There are no standards, and manufacturers can and do change colours whenever they please. Unfortunately, there is no reliable way of differentiating between mineral and synthetic in the field. 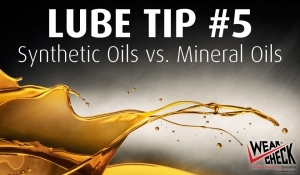 However, because synthetic base oils are white (meaning transparent) as compared to mineral oils, which have a darker natural colour (due to aromatics, sulphur and other impurities), this may be a distinguishing factor. Note, however, that despite the fact that the base oil of a synthetic is white, the additives can add considerable colour (darkening) to the finished oil. In the laboratory, you could distinguish synthetics from mineral oil by looking at a combination of physical properties including VI, flash point, pour point and aniline point. There may also be different elemental additive chemistry. Generally, in the type of application you are talking about, the synthetic gear oil will likely be polyalphaolefin (PAO) based. PAOs are very similar chemically to mineral oils, so mixing the two should not cause a compatibility problem, especially if both oils are the same API classification. However, if a synthetic is required, such as for cold-temperature operation, using a mineral by mistake may cause other problems. Also, be aware that in industrial applications, some synthetic gear oils are polyglycol (PAG) base stocks, which are chemically incompatible with both PAO synthetics and mineral oils. In this case, mixing will result in serious incompatibility issues. Methodical, accurate, technically minded, good organisational skills, exhibit high level innovation and motivation, high attention to detail, team player, conscientious, energetic, good time management and ability to work under pressure. 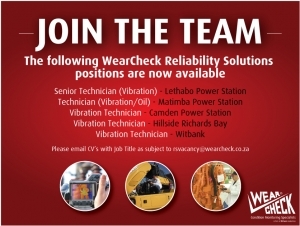 Availability: The successful candidate must be able to start in their position as soon as possible. Applications close on 26th January 2018. If you have not received a response by 7th February 2018, please consider your application as being unsuccessful. 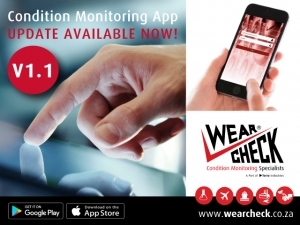 WearCheck’s revolutionary condition monitoring app - WearCheck Mobile - continues to be an increasingly popular choice among customers for communicating with WearCheck about sample results. An updated version of the app was launched recently and offers several upgraded features, including better all-round usability and the ability to check the progress of a sample. Once downloaded onto a mobile device, WearCheck Mobile gives customers highly enhanced access to critical information regarding machinery condition, allowing maintenance decisions to be made instantaneously, based on live data. The app allows customers to access reports, view current samples list, and keep track of unread web/app reports. Notifications about items on this list are sent out as reminders. All data is highly secure, and is now even more nimbly accessible on the app with the “scroll to top” option. One of the highlights and unique features of the app is the interactive key, where customers can ask a diagnostician about a specific sample, and receive an emailed reply on their mobile device. Sample reports can be viewed on the mobile device as either one page (“concise”), or two page (“full”) pdf documents. Single or multiple pdf reports can be emailed to different recipients simultaneously. Sample reports can now be emailed from the equipment search tab. Sample data can be submitted, either via the equipment/component search option (recommended), or via the “submit samples” option, where equipment/component verification is needed for currently-listed machinery. Where applicable, new equipment/components information is created in the WearCheck system. Customers can also view their five-day submission history.